Asia loves HelloKitty, that cute Japanese kitty without a mouth. There is even a HelloKitty 747 plane that I spotted at the Tokyo airport. Well, why not? I had an email address there for awhile: I figured if I wanted to send hate mail, it would look nice with an address “xxxxxx@hellokitty.com”…but I left it lapse, since I don’t really send hate email. But big girls like Hello Kitty too, and one of the running themes on my blog is HelloKitty. Many of the most absurd links come from a guy with Hellokittyhell blog, which if you are a HelloKitty afficianado, you must avoid. I mean, where else can you find out that there are not only HelloKitty Ice Cream, but you can buy your loving wife a HelloKitty AK47 for mother’s day? 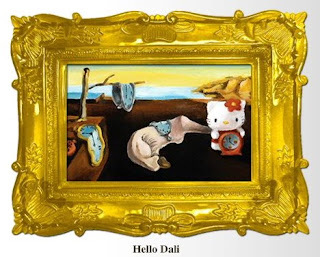 So last week, HelloKittyHell linked to an art gallery with HelloKitty art: Masterpieces with HelloKitty’s face applied. But it’s not a joke. It’s serious art. By juxtaposing the character, Hello Kitty, with quintessential images from art history, the artist creates a clash of iconography whose outcome is a clever intersection of pop culture and antiquity…. translation: She saw DarthVader Kitty photoshop and thought: hey I can do that! But instead of photoshop, she painted them. But actually, the “art” isn’t even good for a laugh: it’s not original, and it’s not well done (For example,the HelloLisa has a small cat face over Mona, as if Mona was wearing a mask, rather than a full sized face as if HK was Lisa). Most of the other scenes are simlar: just a HelloKitty pasted into a classic. Nope, no originality here, folks. It takes an artist with Leslie Holt’s seasoned, cynical humor and formidable eye to layer such familiar references and make them say something new. With Hello Masterpiece, she has perfectly replicated the conflation of high and mass culture that marks 21st century Capitalism. At the same time, each individual work in the series makes its own commentary on perennial issues ranging from love and beauty, to labor and fetishism. Festishism? you mean like THIS? But why is putting a Japanese icon on European masterpieces supposed to say something about American culture? On a more serious note, HelloKitty needs to be put into the context of Japanese art/anime/cuteness. In Japan, even food is presented in a pleasing manner. A Japanese artist who places Kitty into an anime, or makes a Bento Kitty for her child’s lunch box, well, that might be original. Hello Kitty brings a smile to our face, and keeps us cheerful in a world where there is too much ugliness and pain. Because she is gentle, there is a lot of HelloKitty satire on the internet, but even much of that is ironic rather than mean spirited. A good academic could make an original discussion of cuteness in Japanese culture. But to try to elevate art that is equivalent to my granddaughter putting stickers on paintings as if it were a Marxist analysis of evil American culture, well, I don’t know where to begin. Get a life, will ya? The fact that this type of art can be taken seriously by any professor says more about the decadence of the art world and of academia than it does about commercialism or capitalism. No user commented in " Hello Kitty Masterpiece: Academic art gone nuts "